Today EURUSD is under the influence of the European market and US announcements such a German 30-y Bond Auction, Manufacturing PMI and US economic data therefore this pair will be more volatile. 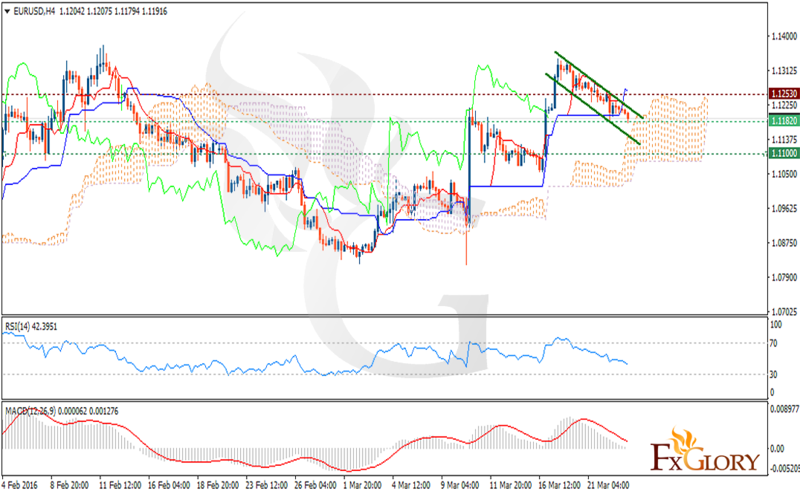 EURUSD is falling within the descending channel however breaking the resistance at 1.1253 can initiate its upward rally. As the support is resting at 1.1182 the price is getting closer to break it and move it to 1.1100. The Ichimoku indicator is showing a strong buy signal. The price is above the Ichimoku Cloud and the Chinkou Span and the Tenkan-sen is showing a horizontal movement while the Kijun-sen is showing upward movement. The price is in positive territory for MACD proving that the price is correcting. If the price declines it will reach 1.1150 and 1.1050 otherwise it will go upward to 1.1260, 1.1350.